For 45 years, Norfolk has borne witness to the tremendous professional growth and countless philanthropic acts of one its most esteemed residents, Lisa Chandler. 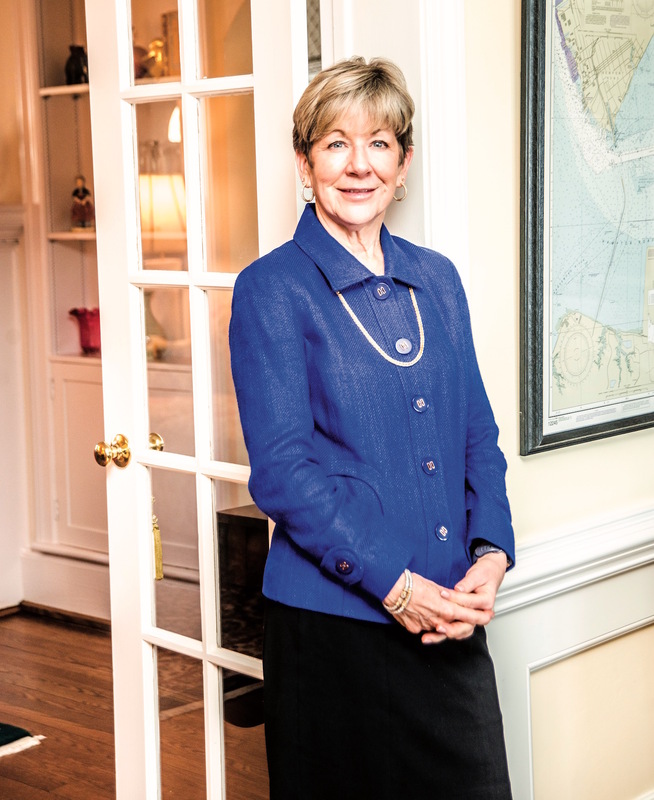 Since her arrival to the port city in 1973 as a sophomore at Old Dominion University, Chandler has served the local community in a variety of capacities, from the pedestrian roles as student and Larchmont resident to her more professional accolades as an unwavering volunteer and prowess as a real estate expert. Chandler currently serves as executive vice president of Chandler Realty, Inc. and principal broker of Chandler Property Management, both of which are divisions of one of South Hampton Roads’ most reputable real estate companies. Despite her hesitation to join the family business 30 years ago, Chandler has thrived as the agency’s community liaison and as an ambitious and supportive leader of brokers, agents, property managers and the like. Chandler’s move to Virginia was one of several relocations she experienced as the daughter of a former Air Force officer. By 11 years old, the unpredictable, yet obligatory commitments of military transfers landed Chandler and her family in six temporary homes around the globe. Chandler’s father ultimately received his final assignment at a base in Northern Virginia, and Chandler was thrilled by the possibility of permanence Virginia offered. She spent the remainder of her adolescence in Falls Church before venturing south to begin her college career as a Virginia Tech Hokie. One year later, driven by the young and ultimately fleeting love of a high school boyfriend, Chandler transferred to Old Dominion University; a decision she claims to be one of her life’s best. “It was the first place that I, without anyone’s help, other than my own efforts, settled into a community. It was something I did all on my own, which I think is what made [Norfolk] so special,” explains Chandler. 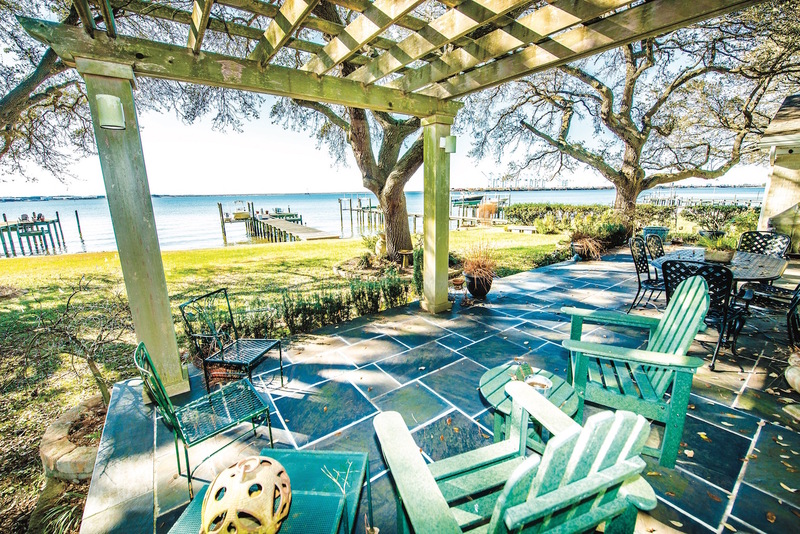 An expansive stone patio overlooks the working Lafayette River with views of Coastal Virginia’s most famed ports. Situated in the back of historic Larchmont, this stunning waterfront abode has been home to Chandler and her husband for over two decades. Chandler’s love for the city is never taken for granted, however. Her insatiable desire for community and yearning to help cultivate and achieve the missions of Norfolk’s local organizations have remained for the entirety of her Norfolk residency. Her passion for volunteerism was adopted shortly after marrying her husband of 37 years, Webster Chandler, III. She took her first steps of her philanthropic journey while attending a meeting for the King’s Daughters Circle, a nonprofit that supports the medical services provided by Norfolk’s Children’s Hospital of The King’s Daughters. Simply searching for a way to meet other young women, Chandler’s involvement in the Circle rapidly escalated from a social venture to a full-fledged membership, even offering to assist in the planning of Holly Ball—an undertaking that began only 10 days after the birth of her eldest daughter, Whitney. Her current charitable contributions include her seat on the Board of the Virginia Arts Festival, association with the Crispus Attucks Cultural Center and Rotary Club of Norfolk, as well as her service on the Project Oversight Team for ForKids, a local organization dedicated to breaking the cycle of homelessness and poverty. Demonstrating significant enthusiasm for organizations pertaining to children, Chandler enjoys the hands-on and focused work that the Project Oversight Team demands. The rigorous demands of both her volunteerism and day job duties are prioritized and met by what Chandler refers to as a never-ending juggling act. Her whole-hearted devotion to each obligation, however, motivates her to approach to accomplish each task completely. Chandler further explains that 2017, for example, was an extremely company-focused year. While her volunteerism was not by any means neglected, her real estate world took precedence. Ironically, the job that now requires much of Chandler’s time is one she never intended to work. The reservations she once had about joining the family business quickly dissipated after her first few days as the part-time office manager at the formerly known Nancy Chandler Associates, a family-owned real estate firm founded by Chandler’s mother-in-law, Nancy Chandler, in 1974. “As I remember it, the part-time lasted two weeks,” jokes Lisa Chandler. Thirty years later, the combination of Nancy Chandler’s driven personality and growing demands of the firm has pushed Lisa Chandler to assume an assortment of roles and responsibilities from office manager and relocation director to completing human resources and communication tasks including health benefits, insurance and hiring and firing. Amidst her ever-changing positions, Chandler also obtained her sales and broker’s licenses. Chandler’s most recent, and possibly most significant, contribution to the family company was her assistance in the rebranding of Nancy Chandler Associates to Chandler Realty, Inc. While for decades the former title served Coastal Virginia well and maintained the firm’s exceptional reputation, the Chandlers currently involved in the day-to-day operations of the firm deemed rebranding a prosperous enterprise. In 2017, the trademark firm divided its real estate and property management services into two separate entities, respectively titled Chandler Realty, Inc. and Chandler Property Management. The two have also obtained a new logo and tagline: Opening Doors. Proudly Local. In addition to Chandler, presently employed at both Chandler Realty, Inc. and Chandler Property Management are her husband, Webster Chandler, III, president; daughter Whitney Chandler, director of communications; brother-in-law John Chandler, chief operations officer; and John’s wife, Charlotte Chandler, real estate agent. The significant family involvement warrants a dynamic that Chandler believes is responsible for the company’s large success. She lightheartedly remarks that working with family is just like working with any other colleagues, except family follows you home. “I think it helps that we really enjoy spending time together,” she adds. 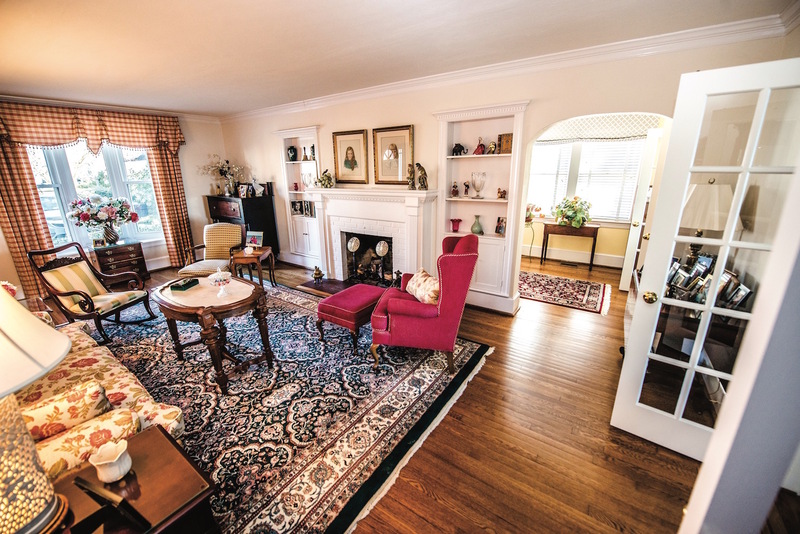 The elegant formal living room showcases the home’s original architecture with built-in shelves, French doors and a white, brick fireplace. 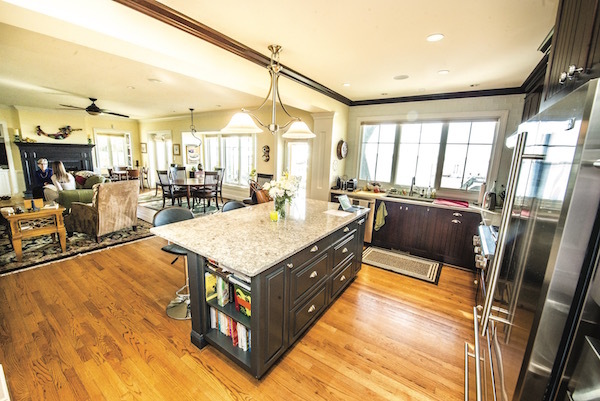 Chandler’s newly renovated kitchen boasts sparkling granite countertops, top-of-the-line appliances and panoramic water views with easy access to both the family room and dining area. Much like the real estate firm, family is the focus at the Chandler residence. Their 1949-built home is situated on the confluence of the Lafayette and Elizabeth Rivers in Norfolk’s historic Larchmont neighborhood and overlooks several of Coastal Virginia’s most prominent ports including the working coal terminals of Norfolk Southern, Norfolk International Terminals and Portsmouth’s Craney Island. The couple has resided in the sprawling, waterside neighborhood for 23 years, as have several other members of Chandler’s family including her parents, mother- and father-in-law, brother-in-law as well as one of Webster’s uncles. Inside, the strong, familial presence is evident in the copious amounts of family portraits and heirlooms displayed on sideboards and within the home’s many built-in wall cases. “Most of our stuff is a collection of things we both grew up with,” Chandler says fondly. While Chandler’s décor may be timeless and unchanging, the house itself has undergone several renovations. 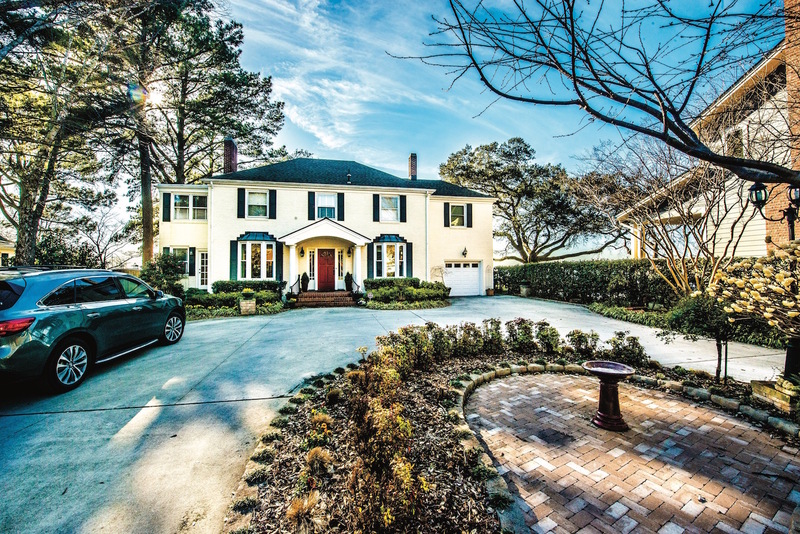 On the exterior, the Chandlers replaced the home’s original wooden deck with an elevated stone patio, as well as remodeled the front porch and now-circular driveway. To better accommodate family gatherings and out-of-town guests, the Chandlers remodeled the home’s former over-the-garage apartment into a spacious living suite equipped with a private bath, kitchenette and sitting area. Downstairs is an upgraded master suite and the home’s most recent overhaul, a sleek, modern kitchen that opens to the spacious family room. Focusing again on family, Chandler enjoys the spirit of togetherness fostered by the open concept floor plan. Between the two spaces, a stunning hand-painted portrait of an old, Eastern Shore Coast Guard Station hangs in stark contrast to the kitchen’s contemporary features. Chandler explains that the decommissioned station, complete with a tower, boat house and three-bay garage, was purchased by Webster’s father and 11 other men as a hunting lodge in 1966. Unaware of how to utilize the secluded property post-season, the corporation decided to convert the space into a multi-family vacation home. The rustic Coast Guard Station is situated on Cedar Island between Onancock and Accomack counties and has been a beloved vacation spot for Chandler and her family for years. Her two daughters, Whitney and Brynn, have shared many weeks among friends and family fishing, boating, swimming and playing ping pong in the restored boathouse. “It’s the most wonderful place in the world,” Chandler says. With Whitney and Brynn now fully grown and residing in Virginia Beach and San Francisco respectively, the long family weekends spent at the Eastern Shore getaway are all the more cherished. And the portrait, though close to Chandler’s heart, is a reminder that these seasonal escapades to a distant, private island are just a small piece of the communal puzzle Chandler has worked tirelessly to create for both her family and fellow Norfolk residents.